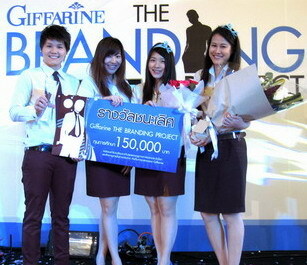 BBA Thammasat: The WINNER of "Giffarine: The Branding Project"
After a round of screening and two rounds of presentations, BBA TU students finally took the first place in the national-wide competition hosted by Giffarine. 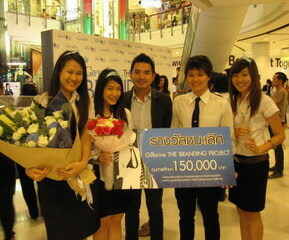 Our team comprised of four 4th year students: Jeannie, Paramee, Pichaya and Tirapong. Over 200 teams all over <?xml:namespace prefix = st1 ns = "urn:schemas-microsoft-com:office:smarttags" />Thailand had participated in coming up with the branding strategy that will help revamp the company�s desired image of value purchase and sincerity. Our branding concept was to bring out the connotation of �gift� from the corporate name in our �better gift better life� campaign, which aimed to elicit theme of sharing happiness from the standpoints of both the end-consumers and the MLM. Posted date: March 26, 2010 � 13:20 hrs.